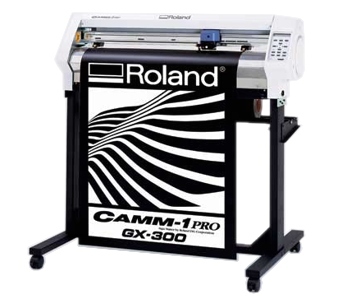 Roland GX-300 vinyl cutter/plotter offers enhanced versatility and is extremely easy to use. Design crisp, clean: decals, stickers, vehicle graphics, window tint, labels, signage, stencils, and even pin striping. 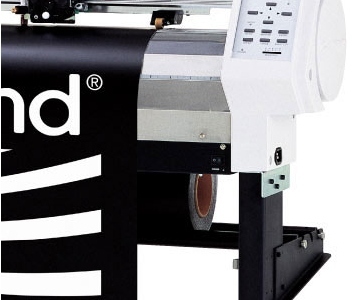 The Roland GX-300 vinyl cutter/plotter also has the ability to contour cut pre-printed graphics which gives you the ability to create heat transfers for garments, full-color POP displays, and even professional vehicle wraps. Roland GX-300 vinyl cutter/plotter comes with bundled Cut Studio design software FREE of charge. The Roland GX-300 is your one stop solution for all your vinyl applications and desires. No other vinyl cutter/plotter offers the flexibility and versatility offered by Roland GX-300. The Roland GX-300 vinyl cutter/plotter lets you shift your graphics into high gear. The Roland GX-300 uses digital servomotors to achieve maximum accuracy and cutting speeds up to 33in. per second. With up to 350 grams of down force pressure, the Roland GX-300 ensures premium cutting with the thickest of materials. As a result, the Roland GX-300 vinyl cutter/plotter yields faster production times with much better looking graphics than other vinyl cutters/plotters on the market. The Roland GX-300 also includes a feature that makes it stand out amongst other vinyl cutters/plotters. The Roland GX-300 vinyl cutter/plotter comes equip with an optical registration system that automatically recognizes printer crop marks to create a powerful and cost effective print and cut solution. The ability to mate an existing printer with the Roland GX-300 vinyl cutter/plotter opens the doors to an endless amount of new opportunities. Use your existing printer to create professional graphics, load them into the Roland GX-300 for a professional contour cut, and begin creating vehicle wraps, heat transfers for garments, and POP displays. From 2in. to 36in. wide, the Roland GX-300 vinyl cutter/plotter accepts a wide range of materials. The Roland GX-300 can cut vinyl, paint mask, reflective vinyl, twill, heat transfer and sand blasting material. With Roland Film Design software, you can even cut window tint film to match nearly all vehicle window dimensions on the market. In addition to the variety of materials and applications, the Roland GX-300 vinyl cutter/plotter is capable of both front and rear loading. You can feed the media backward for a specified distance, then cut and feed the media forward. In addition to the standard media holder, three optional hangers allow you to load two rolls on the front and two rolls on the back. These unique functions allow for greater versatility and faster production time when using the Roland GX-300 vinyl cutter/plotter. The Roland GX-300 vinyl cutter/plotter is fun and extremely easy to use. Even if you have never used a vinyl cutter/plotter before, the operating instructions and control panel are designed to be comprehensive to even the most novice users. 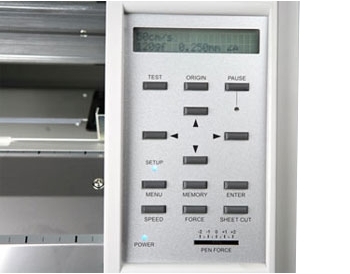 The front panel of the Roland GX-300 vinyl cutter/plotter includes buttons for frequently used settings such as blade force, cutting speed and origin point. The Roland GX-300 can even store cutting conditions for up to eight pre-set jobs, including: cutting speed, blade compensation, blade force, tool movement speed during tool-up and cutting mode. The Roland GX-300 vinyl cutter/plotter along with all of these features makes for a small learning curve. The Roland GX-300 vinyl cutter/plotter includes Roland Cut Studio design software at no extra cost. Roland Cut Studio allows designers to quickly and easily enlarge, reduce, re-position, rotate, and mirror images. Roland GX-300 supports BMP, JPG, STX, AI, and EPS file formats. In addition, the Roland GX-300 vinyl cutter/plotter works with all professional sign making software. As well as a Windows printer driver, Roland GX-300 bundles plug-ins for Adobe Illustrator 9/10/CS/CS2, Corel Draw 10/11/12 for Windows, and Adobe Illustrator 9/10/CS for Mac. Also available is; Roland Film Design, a revolutionary design software that has made a tremendous impact on the auto tinting business. Loaded with powerful design features, Roland Film Design can be used with any brand of vehicle tint film and offers access to over 2,000 different window film pattern kits covering more than 1,000 different vehicles. Roland GX-300 vinyl cutter/plotter; as a result, is a seamless user-friendly operating system. Danny went above and beyond in helping me order the GX-300 Roland cutter. He kept in touch with me, even after the sale, to make sure I had access to the training videos and that I was happy with my purchase. Danny is one of a kind; he's not a sales man, he's a man of integrity and I'm very lucky to have him. Thank you Danny, I appreciate all of your help and kindness.